Hypothyroidism or hypothyroidism is a condition of the body with a low level of thyroid hormones, which indicates a functional impairment of the endocrine organ or pathological processes affecting the hormonal metabolism. Alteratsionny (damaging). You can directly damage the thyroid gland by the immune system. Risk of injury, radiation, medication, temperature, parasitic and other harmful effects on the body. Treatment of hypothyroidism of such form depends on the specific injury. Operating (Surgical). Removing a critical part of the thyroid gland leads to surgically provoked by stress on the body and the subsequent lack of hormones. In the case of hypothyroidism operation, it requires constant (lifelong) intake of drugs containing hormones. Iodine-deficient. Insufficient intake of iodine in the organism does not allow normal functioning of the thyroid gland to produce the required amount of hormone T3 and T4, since their composition is iodine. The main direction in the treatment of iodine deficiency hypothyroidism, is the intake of the required amount of iodine. Diseases of the pituitary / hypothalamus glands. Damage or functional failure of regulatory activity of the thyroid gland structures (pituitary gland and hypothalamus), are capable of changing its state (decrease functional activity). Treatment is complex, for this secondary type hypothyroidism. Quite often internal diseases or conditions with energy deficiency contribute to the development of hypothyroidism. In such cases, the need of thyroid hormones grows. Initially, the increased load for hormone production is compensated and does not show changes in the thyroid gland or any other signs. Later, to perform tasks for the production of hormones, in the gland its tissue converts, develops the general and / or local increase of follicles, thereby forming a diffuse and / or nodular goiter. The main symptoms of hypothyroidism are at: weakness, lethargy, drowsiness, memory loss, apathy; decreased interest in the environment, reducing disability. Patients with hypothyroidism delayed speech, reduced hearing, low hoarse voice. They are inhibited, look indifferent. A typical symptom of hypothyroidism is a swelling of the subcutaneous tissue, especially the eyelids, face, sometimes there is swelling of the extremities, the so-called gipoteroidny swelling. In Ayurveda, a composition of plants are used to normalize thyroid function and to improve metabolic processes. these medicinal plants are Kanchnar, guduchi, Varun, Cardamom, Trikatu, Cinnamon. All these plants coupled with Shilajit, Guggul etc are part of the medicine Sattva Ekrin capsules. Increases the production of thyroid hormones. Creates the necessary balance of hormones. Eliminates dryness and flaking of the skin. 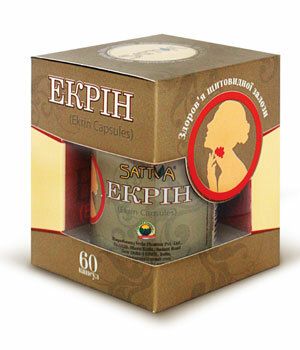 The main ingredients of Sattva Ekrin capsules. Kanchnar (Bauhinia variegata) – its bark. contains tannins, essential oil. Has anti-inflammatory, astringent, antibacterial, antiviral effect. Guduchi (Tinospora cordifolia) - Traditionally used in Ayurvedic medicine to strengthen the immune system, healing of wounds and injuries. Varuna (Crataeva nurvala) - large branched tree height of 7 - 9 m. It grows throughout India. Has a smooth gray bark with vertical cracks. Has litotripichnym and tonic properties. Bark of Varuna is used in Ayurveda as an anti-inflammatory, antipyretic, laxative, anthelmintic and diuretic. Contains flavonoids, glucosinolates, plant sterols, saponins, tannins. Antioxidant. Ela (Elettaria cardamomum) - is one of the oldest spices in the world. Cardamom was first cultivated in South India even before history was written in the evergreen forests of the western states, where now are its main plantations grows. This is a perennial herbaceous plant 3 - 4m from ginger family. Seed of the plants are used. The seeds contain essential oil. It contains: terpineol, cineole, protein, fatty oil - 10%, and others. The essential oil is widely used in Ayurveda. Cardamom has a sharp, sweet and astringent taste. It Improves digestion, cleanses the stomach and intestines from pathogenic microorganisms, fungi, strengthens the heart, used to relieve arrhythmias. It cleanses the mouth, removes odor. It is Aromatic, stimulating and refreshing agent. It increases the digestive fire, refreshes the mind, stimulates the heart and strengthens the lungs. Trikatu-sharp blend of three flavors - Black pepper (Piper nigrum), Pippali (Piper longum) and Ginger (Zingiber officinale) - clears toxins, improves the appetite, enhances digestion, is carminative and expectorant. Dalchini (Cinnamomum zeylanicum) - known for a very long time. Cinnamon bark is traditionally used in Ayurvedic medicine. The composition of spices are: up to 65% cinnamic aldehyde, eugenol, oils, starch, resin, tannins. It has anti-inflammatory, antipyretic, diuretic properties. Is used as a stimulant, tonic and antiseptic. Has antibacterial, antiviral and antifungal effect. Shilajit (Asphaltum) - Contains a balanced set of biologically active substances: proteins, amino acids, lipids, fatty acids, macro- and microelements, vitamins group. It has a wide spectrum of pharmacological activity and provides immune system enhancement. Used as a tonic to increase strength, improve health and longevity. Guggul (Commiphora mukul) - gum (resin), which is formed from the milky juice of tree guggul. It is one of the most widely used plant in Ayurveda.. It has a strong cleansing and antioxidant action. It stimulates the activity of the thyroid gland. The diet should be of easily digestible meals and soups, wheat, millet, buckwheat. Eat a large number of seasonal fruits and vegetables. Reduce your consumption of dairy products, especially with high fat content. Avoid heavy meat, fatty and fried foods, sweets, alcohol. Good yoga and breathing practices (pranayama). Kanchnar (Bauhinia variegate), Guduchi (Tinospora cordifolia), Varuna (Crataeva nurvala), Ela (Elettaria cardamomum), Black pepper (Piper nigrum), Pippli (Piper longum), Ginger (Zingiber officinale), Dalchini (Cinnamomum zeylanicum), Shilajit (Asphaltum), guggul (Commiphora mukul). Hypothyroidism - hypothyroidism, decreased metabolism of the body. Hypersensitivity of the components of the drug and pregnancy.